So how do you make sure your text message marketing efforts are driving real value to your customers (and your business)? The first step is to make sure you’re delivering an offer that makes sense to send to your customers’ phone. Otherwise, they’ll most likely opt out of the service and walk away with a bad customer experience. A good rule of thumb is to always take a step back and ask yourself, would I want this message going to my cell phone? If that answer is anything other than a strong yes, don’t send it! This is an easy and effective way to increase traffic during your slower days and/or times. There’s no reason to waste your money on expensive flyers when you can get the message straight to your customers’ phones at the perfect time. 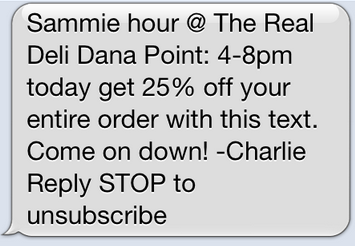 Special text message deals are a great way to encourage current customers to bring in their friends. Once you enroll this new customer to your loyalty program, you’ll expand your database, effectively increasing your marketing reach. Unlike other text message marketing providers on the market, FiveStars uses the spending behavior data tracked through your customized loyalty program to offer you very targeted customer segments. This enables you to choose what type of customer you want to deliver your message to, whether it’s just your VIPS, your new customers, or those who haven’t stopped by in a few months. You’ll also be able to build a much larger database of customers than you would with any other text message marketing program. Customers are much more likely to sign up for your loyalty program than they are for a standalone texting service because they’re offered a tangible incentive, the reward. This entry was posted in Best Practicies, Get to Know FiveStars, Industry Advice and tagged Customer Loyalty Program, customer referral programs, Digital Loyalty Cards, digital loyalty programs, FiveStars Loyalty, rewards program for small business, text message marketing for small business. Bookmark the permalink.